Welcome to Day 5 in the 31 Days of iOS. In yesterday’s article, we showed a few different ways to display a second view controller in our app. Specifically, we looked at pushing a view controller onto the view hierarchy of a Navigation Controller and how to present a view controller as a modal. Both of these techniques demonstrated ways to display view controllers via storyboards. Today we’re going to follow up by showing how to programmatically display view controllers. You can download the code we’re going to start with (from yesterday’s article) here. If you do so, you’ll need to remove the segues between the two view controllers. If you’d like to follow along with the completed code, you can access it here. We’re going to make the navigation bar button (the one that says “item”) present the second view controller by pushing it onto the Navigation Controller. Then we’ll look at showing the second view controller as a modal when the user taps the Show New Video button. If you’ve pushed a view controller before when Xcode used individual Xib (pronounced NIB) files for user interfaces, then this may look a little weird. 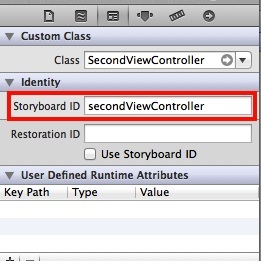 Instead of just allocating a new instance of the SecondViewController and pushing that, you need to use the instance of the UIStoryboard that is tied to the view controller you’re in to instantiate the second one. We had to set an identifier in the storyboard so the storyboard would be able to recognize which one we wanted to instantiate. If you tried to just instantiate and push an instance of the SecondViewController, the application would run but the view would appear black. 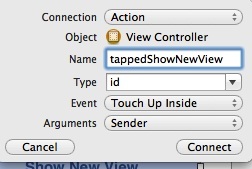 This is because it can still create an instance of the view controller but the code isn’t tied to any user interface. Now if you run your app and tap the bar button item it will push the second view correctly. Again we’re instantiating the SecondViewController using the storyboard. Instead of pushing the view controller, we’re calling presentModalViewController. Now when you run the app and tap the Show New View button, you’ll see the second view controller as a modal. UPDATE 1-7-2013: As Venkata has pointed out below, the presentModalViewController has been deprecated in iOS 6.0 (this article was written pre-release of 6.0). Going forward, you should be using [self presentViewController:secondViewController animated:YES completion:nil] in place of the deprecated method. Today we saw how to display view controllers programmatically. 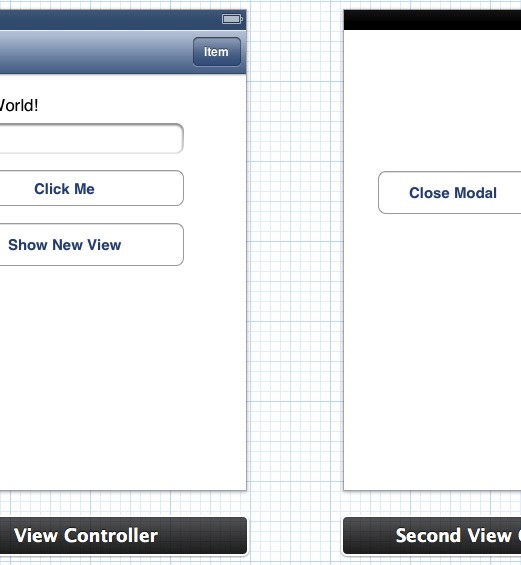 Now you’re fully capable of displaying view controllers through the storyboard builder and in your code. Keep in mind that both of the code side techniques are only useful for displaying view controllers programmatically when their UIs are defined in storyboards. If you’re using Xibs, you can just alloc and init the view controller. You can download the final code from today here. Thanks for pointing that out. I'd actually written this article before iOS 6 was fully available so I had missed that (I think you'll see in later articles I'm no longer using methods that are depreciated in 6.0). I'll note this above. We are supposed to manually add the import statement for SecondViewController.h then? Yes, the import statement isn't mentioned but is something you'll need to do. Thank you Chris for the tutorial. I have tried to link page 1 to page 2, then from page 2 to page 3 by using storyboard id. It works fine between page 1 and page 2. However, I could not link page 2 to page 3. There is no error messages. Do we need to add any other code in order to link page 2 to page 3? Solved the problem. Typo mistake. I used presentedViewController instead of presentViewController. Thank again Chris, excellent tutorial. For some reason, when it performs the segue to the next view controller, it presents a blank white view controller instead of the controller I assigned it to? Update, I found the problem. I was assigning instigating it to one of my view controllers, instead of the root view controller. Thanks, it works great!